Throughout the 2014-15 regular season, The Hockey Writers kept up on some upcoming milestones for each NHL franchise. They were categorized into individual milestones, franchise marks and players that found themselves in the top 100 of all-time in specific statistical categories. With the Chicago Blackhawks taking their third Stanley Cup in six years, it seemed fitting to look at some of the milestones met over their playoff run – broken up into the same type of categorical makeup. A number of players were around for all three of their most recent Cups. That alone makes these numbers interesting and informative in just how experienced these Blackhawks players are when it comes to the NHL playoffs. With that in mind, here’s a look at five milestones reached by members of the Blackhawks organization in the 2015 NHL playoffs. He’s played in parts of 17 seasons with five different NHL teams – and nearly 1,200 regular season games. 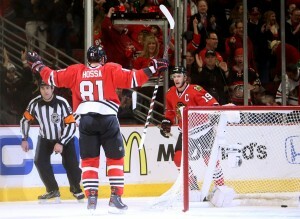 During that time, Marian Hossa has quietly put up 1,056 points (486g-570a). When it comes to the playoffs, Hossa reached an NHL milestone in the 2015 playoffs. Playing in 23 games with the Blackhawks, Hossa passed 24 former skaters on the NHL’s all-time list for career playoff games played. So where does he sit all-time? Well, with 194 playoff games under his belt, Hossa is tied for 18th with defensive great Paul Coffey – two games back of Steve Yzerman and six back of Jari Kurri. Among those that Hossa passed during the 2015 playoff season were Ron Francis and Stephane Yelle (171 games played), Mike Modano (176 games played), Tomas Holmstrom and Henri Richard (180 games played) and Dale Hunter and Esa Tikkanen (with 186 games played). In 2015, Hossa passed Stephane Yelle (171), Ron Francis (171), John Tonelli (172), Joe Sakic (172), Chris Pronger (173), Darren McCarty (174), Steve Thomas (174), Ken Daneyko (175), Mike Modano (176), Craig Ludwig (177), Al MacInnis (177), Tomas Holmstrom (180), Henri Richard (180), Bob Gainey (182), Doug Gilmour (182), Charles Huddy (183), Sergei Fedorov (183), Brendan Shanahan (184), Bobby Smith (184), Denis Potvin (185), Dale Hunter (186), Esa Tikkanen (186), Mark Recchi (189), Craig MacTavish (193) on the NHL’s all-time list for playoff games played. While he had a sluggish start to the 2015 NHL playoffs, Corey Crawford came back with a vengeance and led the Blackhawks to their third Stanley Cup in six years. Along with his third Stanley Cup, his 13 wins during the playoff run also landed him a spot in franchise history. His 2015 playoff win total gave him 45 in a Blackhawks uniform tying him for first on the franchise’s all-time list with Hall of Famer Tony Esposito. Had Crawford won one more game, he’d sit in sole possession of the team’s all-time playoff wins. However, he did win his 45 in just 76 games played for the Hawks while it took Esposito 99 games to reach the same mark. In 2015, Crawford passed Ed Belfour (35) on the Hawks all-time list for playoff wins. Three members of the 2015 Cup winning Blackhawks finished the playoff run with 117 career playoff games in a Chicago uniform. Patrick Sharp, Niklas Hjalmarsson and captain Jonathan Toews all sit tied for third on the Hawks all-time list. They’re only 14 games back of Denis Savard and remain 38 games back of legend Stan Mikita. The rank of these three players – two of whom have spent their entire careers with the Blackhawks – shows just how much experience the core of this franchise has. In 2015, Toews, Sharp and Hjalmarsson passed Doug Wilson (95), Dennis Hull (97), Doug Jarrett (99), Keith Brown (103), Steve Larmer (107), Bob Murray (112), Chico Maki (113), Eric Nesterenko (115) and Bobby Hull (116) on the franchise’s all-time list for playoff games played. There’s something special about the way some players exit the game. We saw it with Ray Bourque when he won his first and only Cup in Colorado and again this year when Kimmo Timonen risked his health to give it one more shot. The risk, however, paid off. Timonen played in (likely) his last NHL game and the Hawks pushed their way through playoff ups and downs to help the 40-year-old raise his first career Stanley Cup – a feat that many players never have the chance to experience. While it’s not a statistical milestone, the chance to hoist the holy grail is a career milestone for any player to suit up in the NHL. Not a player, but he’s certainly one of the best in the game. Scotty Bowman joined his son on the stage as the Chicago Blackhawks celebrated their big win at Soldier Field following their parade. 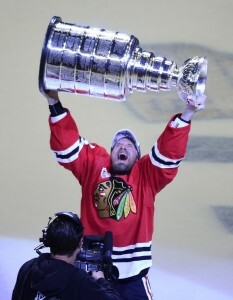 But for the elder Bowman, he wasn’t just celebrating another Cup win with the Hawks. No, he was celebrating being a part of his fourteenth Cup-winning team. It’s a milestone that is certainly hard to reach. Scotty Bowman, casually celebrating his 14th Stanley Cup. Hockey royalty. A God. Bowman recorded nine Stanley Cups as a head coach – five with Montreal (1973, 1976, 1977, 1978 and 1979), one with Pittsburgh (1992) and three with Detroit (1997, 1998 and 2002). He’s also won five as a member of team front offices – as the Director of Player Development for Pittsburgh (1991), consultant with Detroit (2008), and as Senior Advisor of Hockey Operations for the Hawks (2010, 2013 and 2015). While he holds the record for most Cups as a non-player, Bowman remains three short of Jean Beliveau on the all-time list (as Beliveau won 17 combined as a player and non-player). Still – it’d be hard to be disappointed with Bowman’s success over the years.